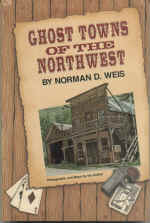 Description: Sixty-two ghost towns from Oregon. Washington, Idaho, Wyoming, and Montana are individually described with the history of each town and specific directions on how to find it. Nearly 20 are unknown to the general public, never before mentioned in print, or mysterious in origin and location. Many of Weis's great stories were found by listening to the old-timers who knew of these places firsthand. 6x9, paperback, 248 photographs, 16 maps, 319 pages, bibliography, index.